Saif Ali Khan, Kareena Kapoor's wedding card out! It looks like the D-day is soon to arrive this month. Yes, we are talking about Saif Ali Khan, Kareena Kapoor's much-awaited wedding, that is all set for this month. The good news is that Saifeena's wedding card is finally out. And, we are here to present before you the first look of the 'Nawaabi' marriage card. The image below is the first look of their wedding card. 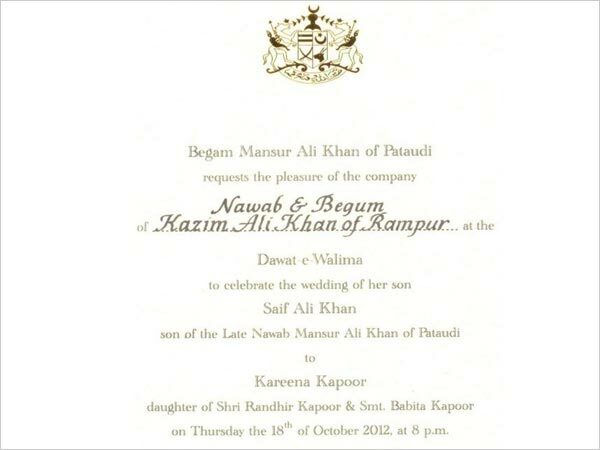 The card has been adressed to to Nawab and Begum Kazim Ali Khan of Rampur in Uttar Pradesh. And, as confirmed by Sharmila Tagore before, Saifeena's Dawat-e-Walima (wedding reception) will take place on October 18. It has been revealed that for Saifeena's wedding, more than fifteen varieties of paans from Jaipur which would be served to the guests at the entrance. Reportedly, the wedding will take place on October 17 at the Pataudi palace and only select few friends and close family will be present for the occasion.